In order to have a year of health, harmony and abundance, it is also important to remain mindful of our behavior and intent towards others. It is said that in order to protect and strengthen one’s health, it is important to cultivate patience and kindness rather than anger. In order to protect and strengthen one’s wealth, it is important to be generous rather than greedy. And in order to protect and strengthen one’s life-span, it is important to protect the life-span of other beings rather than damage or destroy it. This benefits not only this very lifetime, but also the circumstances of our future lives. In that way, the positive forces within us are truly victorious. 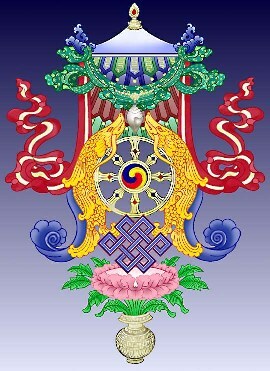 Posted on February 12, 2013, in Tibetan Culture & History, Uncategorized, Yungdrung Bon Sacred Symbols and tagged Asian studies, Buddhism, Losar, sacred art, spirituality, tibet, Tibetan culture, yungdrung bon. Bookmark the permalink. Leave a comment.